With 2013’s New Year’s resolutions newly minted (and some as yet unbroken, even), it’s a good time to turn our attention to physical fitness. And don’t worry—no guilt trips or discount gym membership pitches! This discussion is about balance balls (for kids). 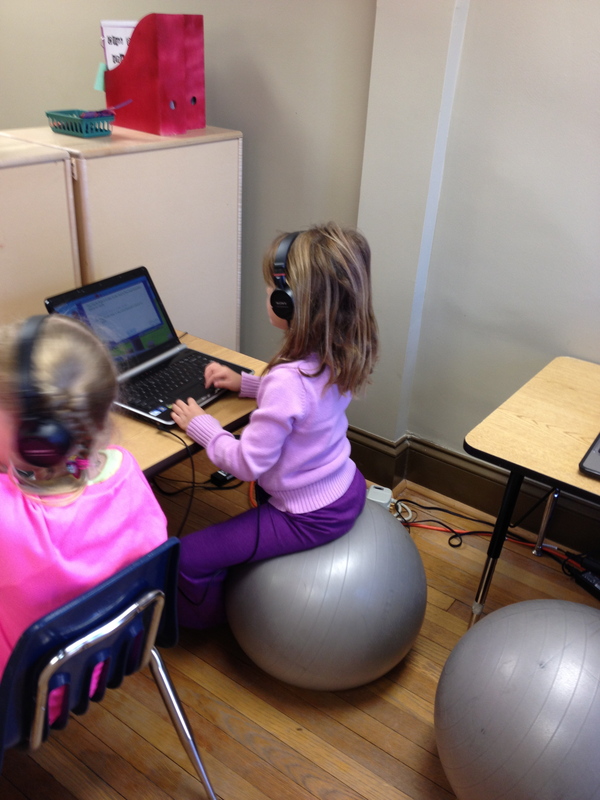 Students have the option of sitting on a chair or balancing on a stability ball at the computer station. Also known as stability balls, these large inflatables are more traditionally used for pilates-type exercise, but they are rolling into more and more classrooms as seating, particularly for elementary kids with all that energy to burn. They are considered effective for strengthening core muscles and improving spinal alignment. 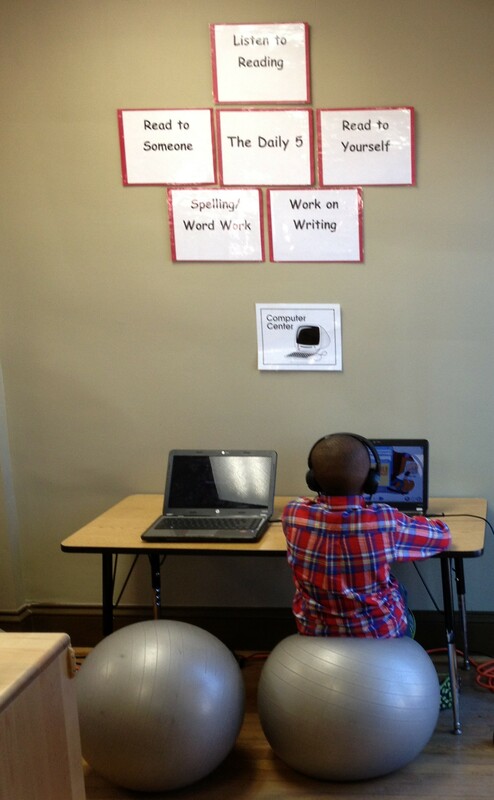 In the classroom, they additionally help students sit up straight, reduce their distractibility, and keep them aroused. Classroom balance balls were originally used in an occupational therapy context. They improved focus in kids with attention deficit hyperactivity and sensory processing disorders, presumably by giving an outlet to their “wiggles.” Think of it as channeling all that excess energy for positive use. Then researchers noticed other incidental improvements, in obesity and classroom productivity, for instance. Regarding obesity, scientist have long known that even the smallest additional daily movement reaps disproportionately large physiologic rewards. So, the balance ball, by requiring continuous core muscle engagement to remain seated on it, is eliciting constant movement, thereby enhancing health and fitness. Note this student’s posture as he balances fitness with his Daily 5. By the way, you can learn more about the balance balls firsthand at the TNCS Elementary Information Night on Thursday, January 17, 2013 from 6:00–7:30 p.m. for current and prospective families. This will be the ideal opportunity to familiarize yourself with TNCS’s elementary programs (expanding to include through grade 4 in the Fall of 2013), to ask questions, and to hear other families’ experiences. Free childcare is also available. Click the above link to find out more and to RSVP. You don’t want to miss it! Kindly let us know your thoughts about this post in the comments section—we love to hear from you! Also, did you know? Any green text within the body of a post is a clickable link that takes you to related online content. There’s a lot of good information to be explored this way!